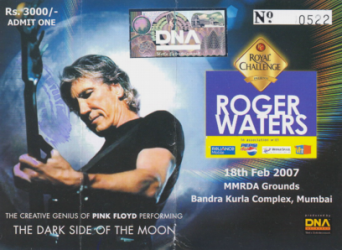 Roger Waters, February 18 2007, MMRDA Grounds, Bandra Kurla Complex, Mumbai, India. This is an AMAZING audience recording done by Rob “the human mic stand.” The audience is super charged and Roger and the band are in top form. Here is a cool Indian TV news story from IBNLive.com about the concert. Here is an interview I did for a blogger in India that I mention in the podcast. This entry was posted in Roger Waters by Doc. Bookmark the permalink.